This product is a download only, there will be no physical disc included. After purchasing, you will receive an email with the product key to activate the software and the link to download from Microsoft's website (within 24-48 hrs). The product key you are purchasing will convert the trial version you are downloading to a full, non-expiring version. The key and download link will be emailed the same business day when ordered before 3PM MST. 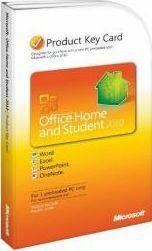 With Microsoft Office Home and Student 2010, you and your family can create great schoolwork and home projects, from multi-page bibliographies to multimedia presentations. Enhanced tools and features help you organize your household more efficiently and succeed as a student. Office Home and Student 2010 features new photo, video, and text effects for creating standout documents and presentations. Capture ideas and set them apart with video-editing features and dynamic text effects, then easily collaborate with classmates without being face-to-face thanks to new Web Apps tools. Office 2010 is an industry standard offering our latest, innovative tools to make your documents richer and more informative. With these great Office 2010 programs, you are given free-reign to create and design your own personalized files and projects for a multitude of occasions. Bring your PowerPoint 2010 slideshow to life with state-of-the-art graphics, video, animations, and transitions. The new Microsoft Office Backstage view and improved Ribbon experience help you quickly navigate the tasks and commands you rely on, enabling you complete to your work more efficiently. A) When prompted to activate your Office Home & Student 2010 installation, Choose to activate "by telephone"
B) After choosing to activate by phone, click "Next" and follow the on-screen instructions to call Microsoft Toll-Free Number that appears on your screen in your Zone or Country. C) Please follow the automated instructions by telephone to manually enter the series of digits that are displayed on your screen using your phone keypad. D) Once you complete the automated instructions given to you by Microsoft automated service, you will be given a series of numbers by the automated service, you will then follow instructions to enter them unto your screen to activate the software. Once this process is complete you click "NEXT" and you have now activated your software. The entire process takes about 3-4 minutes to complete.